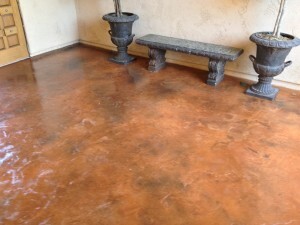 Arrowhead Deck and Concrete LLC has offered concrete resurfacing services for more than 20 years. In the process, we have become a preferred contractor for deck resurfacing, concrete coatings, garage surfaces, stairways, walkways and ramps, and pool area repairs in industrial and commercial environments. We can help enhance the interior and exterior look of your property to increase its market value and improve the area’s safety for the welfare of your employees and customers. When it comes to your concrete resurfacing project, your choices are limited only by your own imagination. 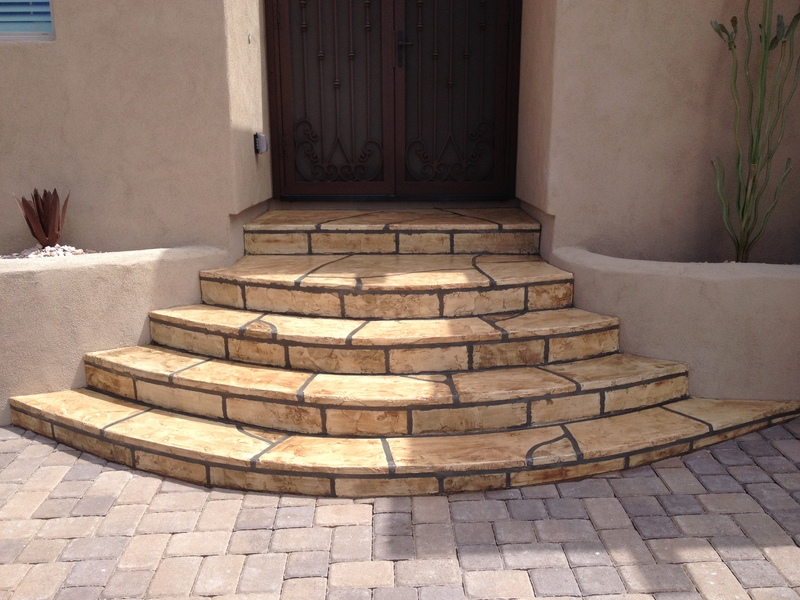 We offer unlimited colors and designs to customize an application for interior or exterior concrete resurfacing needs. We can embed lettering or graphics to reinforce your commercial brand, create unique styles and textures such as leather or wood, and are expert at applying a range of interior and exterior products including acid stain and flagstone. We guarantee the highest quality materials and the most professional service at extremely competitive prices. And, we offer the best warranty in the industry to protect your investment. Concrete resurfacing is the application of a thin cement-based overlay on top of your existing concrete. It is used to repair damage and hide flaws to give your location a fresh, new look. In the past, when a concrete area showed serious signs of aging, the only choice was to jackhammer or bulldoze it up and replace it. Today’s high-quality concrete resurfacing options can give you a safe and beautiful new surface, with better durability, at a much more reasonable cost. Concrete resurfacing compounds contain special bonding agents that reinforce its adherence to the existing surface. Applications include concrete polishing and repairs for your business, restaurant, cool room or warehouse. Or, you may need waterproofing and repair to structural damage in industrial and commercial areas like parking decks, shopping centers, government buildings, and industrial units. 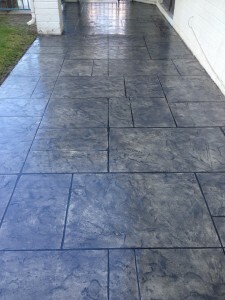 Concrete resurfacing is much more economical than ripping up and replacing old concrete. You get the look of a brand new surface for up to three times less than the cost of installing one. And, all previous damage is hidden, which increases the value of your property. Concrete resurfacing saves time. You cut out the time involved in jackhammering or bulldozing the old concrete and hauling it away, so you can resume regular business activities sooner. Concrete resurfacing gives options for designs, colors and finishes that can update your property and increase its value. You can have the look of marble or granite without the expense, or customize with specific colors and graphics to reinforce your brand. Concrete resurfacing is extremely durable. Your resurfaced area will be resistant to stains, tire marks and will hide minor imperfections, with the potential to last much longer than the old surface. Conditions: The best results are obtained when concrete resurfacing is planned for days with low humidity and no rain for at least eight hours after the application. Exterior concrete should not be applied in cold weather; air temperatures should be between 70 and 75 degrees. The surface temperature of the existing concrete must be at least 50 degrees and stay above 40 degrees for at least 24 hours. Make any structural repairs necessary, and mitigate drainage issues that contribute to cracking. Clean the existing surface to remove all organic matter including dirt, mildew or algae. Patch chipped and cracked areas, fill divots, then smooth over all patches and let them dry. Spread the concrete resurfacing mixture to its optimal thickness. It stays workable for only a specific amount of time, so the job will be planned in sections. Smooth it out, adding textures for decoration or non-slip finishes. Block traffic until it is fully set. Deteriorating concrete on your property isn’t just an aesthetic problem, it can become a safety issue. Repairing and resurfacing damaged concrete is important for maintaining the safety of your employees and customers and for the health and well-being of those who must use it every day. Concrete resurfacing can provide a non-slip, safe and easy-to-clean flooring surface, even if it experiences heavy use. And, with the proper preparation and planning, the surfaces can be non-slip and impact-resistant for the long term. Call us when your concrete requires maintenance. We at Arrowhead Deck and Concrete LLC will review your facility’s needs, recommend necessary preliminary repairs, advise you on the best materials and methods, and provide a superior installation experience for your concrete resurfacing project. Contact us at 623-980-4371 to schedule a free consultation.